KABUL, Afghanistan - Afghanistan would support Pakistan if there were a military conflict between Pakistan and another country, including the United States, told Pakistani TV television in an interview broadcast Saturday. The comments were made during an interview with Geo Television, and come amid recent tension between the two countries over border violence and accusations of Pakistani involvement in the September 20 assassination of an Afghan peace envoy, former Afghan president Burhanuddin Rabbani. "God forbid, if ever there is a war between Pakistan and America, Afghanistan will side with Pakistan," Reuters quotes Karzai. 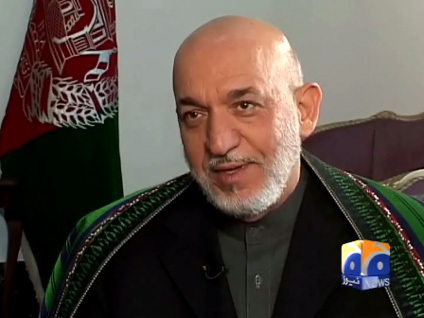 Karzai also said that if Pakistan were attacked by another country and needed help, "Afghanistan will be there with you. Afghanistan is a brother." "Afghanistan will never forget the welcome, the hospitality, the respect, and the brotherhood showed by the Pakistani people towards the Afghan people," Karzai said. "Pakistan will never betray their brother." He said that would be the case regardless of whether the country was India, China or the United States. "Afghanistan is not going to be dictated in any way by any country - U.S. or India or Russia or China or whoever. Afghanistan has its own policy, its' own stand, its own clear view of things, and from that point of view, from that stand, it's dealing with our brothers in Pakistan."